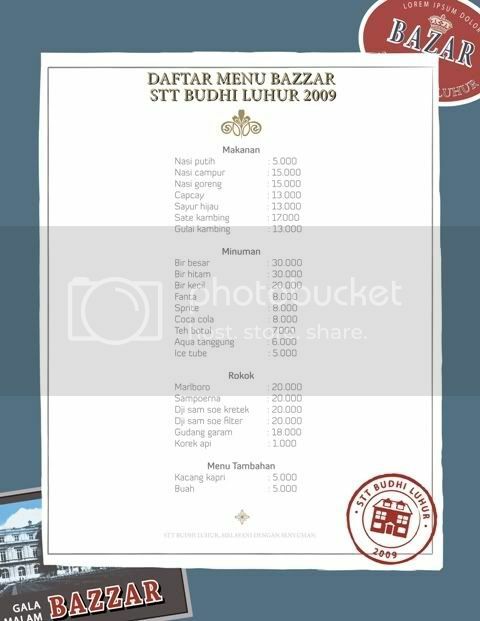 A few days ago my friend told me, that she need help to make a menu order design. Then I used the Adobe Illustrator template to finish this job. Yeah, I don't have much time to make a pure design that come from my mind. So just take a look on this simple design. Thanks a lot for sharing the article on template. That's a awesome article. I enjoyed the article a lot while reading. Thanks for sharing such a wonderful article. There are lots of information about on template that also could be awesome. This is exactly what I was looking for. I was in a great hunt for creating a short template. This has saved my time and money. I'd really like to read more of your blogs and to talk about my opinions with you. I will be your frequent visitor, that’s for sure. sangat simple, bagus buat fast loading. Good..Very useful blog.. ^^ keep posting..
thank you very much for share it. Superb design you have shared thank you for sharing. It may feel like no one reads this, but some of us do. I gave up doing my blog for that reason and now I just post on other peoples. This is great! I'm still a novice, this is so useful to me. Thank You.. Thank you for this post. I love the nice and simple approach. I recently was looking for a menu design to compliment my new restaurant. It is pretty impressive those things that you can do with Illustrator. There are people that they can do amazing stuff with gimp. I really like this template, but if I wanted to add in some other menu graphic design elements would I still be able to do that? Or am I kind of stuck with what I've got on there? Its excellent information for us, I like it. Thanks for sharing..........!! Really Awesome and professional menu design here . thanks for sharing with us . Menu design template i was finding such tutorials . Thank you so much. Great tutorials . Keep continue sharing such tutorials with us .